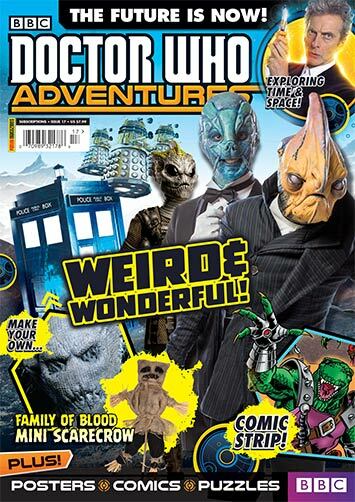 You know something has been missing from your summer… well that’s all about to change with the latest issue of Doctor Who Adventures! James Peaty, Russ Leach and John Burns take you to Earth Colony Vourakis as we encounter the Skinks holding the planet to ransom! Can the Doctor avoid being dragged into a black hole? What do you think? It’s time to test your alien knowledge with this universe-wide mastermind quiz! Missy shows you how to make your own terrifying Family of Blood Scarecrow! Find the Doctors in a crazy Shopping Mall scene! STRAX AND THE TIME SHARK! Strax takes on the school bullies with a little help from his Time Shark! The Paternoster Gang investigate the Curious Case of the Miniature Menaces! Doctor Who Adventures #17 – The Future is Now!